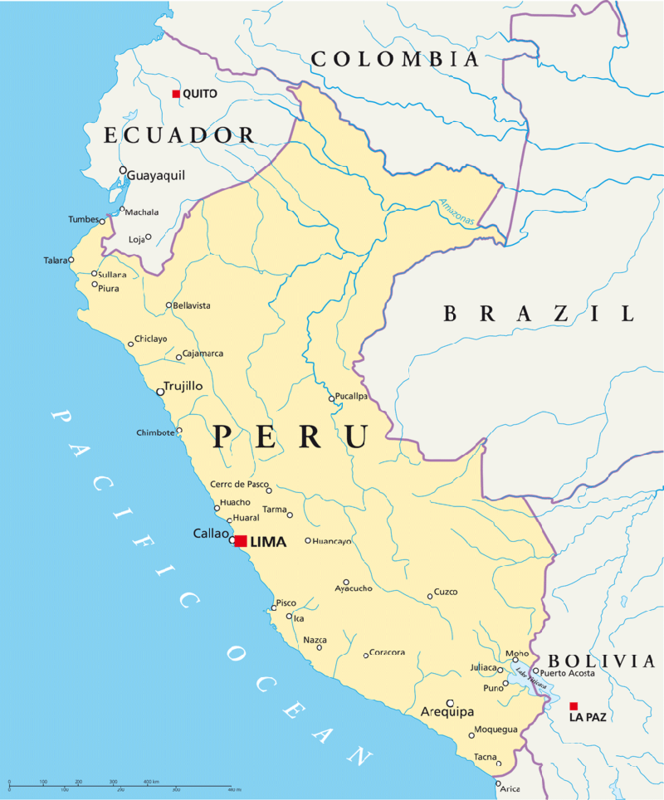 Lima, the coastal capital of Peru, offers visitors a wonderful choice of restaurants, ancient and modern museums and colourful markets, but little evidence of the true nature of the country. The Gold Museum, a private collection left as a legacy to the country of a whole range of gold treasures, the Larco Herrera Museum, for pre-Colombian art and artefacts, and the Museo Mario Testino, opened in 2012 by the famous fashion photographer, are all highly recommended. To the north of the city lies the first of many archaeological sites to be found, this, along with the 12,000BC Pikimachay Cave, Chachapoyas, the 15th Century town and, of course, Machu Picchu, mark Peru as an outstanding destination for anyone interested in extraordinary examples of past cultures and their ruins. South from Lima lie the huge geometric patterns of the Nazca Lines, etched by a past civilisation into the surface of the desert and UNESCO world heritage site. South again takes you to the Colca Canyon, plunging to twice the depth of the Grand Canyon, and the ‘white city’ of Arequipa, standing out starkly against the backdrop of the dramatic El Misti volcano. In contrast, with rainforest covering over 60% of the country, Peru also provides excellent jungle experiences. Reached via Iquitos in the north, or Puerto Maldonado in the south-east, you will find typical verdant jungle, alive with the sounds of buzzing insects, croaking frogs, and the raucous calls of monkeys and brightly coloured macaws. The Manu Biosphere Reserve is the largest conservation area on Earth, and it will provide, with luck, a glimpse of black caiman, giant otter or elusive jaguar. Cuzco, once the capital and centre of the great Inca civilisation, should feature on any itinerary to Peru. This is a richly atmospheric Andean town with terracotta tiled colonial buildings set on top of perfectly aligned Inca stonework. The inhabitants are primarily Quecha-speaking Inca descendants who continue to live in a fairly traditional manner, albeit with an interest in adding to their income from visitors. The markets are wonderful and the city’s central square is a lively focal point of daily life. On a hilltop overlooking Cuzco lie the great Inca ruins of Sacsayhuaman, where the greatest of the traditional Inca festivals, Inti Raymi, is celebrated at the winter solstice (in June). Lying to the west of Cuzco are the incredible ruins of Machu Picchu, the ‘Lost City of the Incas’, perched upon sheer-sided mountains. Whether you take the train from Cuzco, travel via the Sacred Valley or walk the Inca Trail (in whole or part), your first site of Machu Picchu will take your breath away. The Spanish Conquistadors never found it and its history continues to be debated; either way, Machu Picchu is fascinating. From Cuzco, take the train through the mountains to La Raya and on to the Altiplano, the high plains. Ahead lies Juliaca, Puno, the vast expanse of Lake Titicaca, one of the highest bodies of water in the world with fascinating festivals, and in the distance, Bolivia.